When I step into Ellington’s, a café modestly ensconced on a stretch of St. Clair Avenue West between Winona and Arlington streets, I feel as if I’m entering a little oasis. It’s perhaps the music that wafts in the air. Whether it’s jazz, reggae or some obscure genre, the cadence sweeps me into a relaxed mode as I gaze at the bright yellow walls that display the timeless black and white photos of Bob Marley and Charlie Parker. At the back, a piano, cello, guitar and drums sit there, ready, available, tempting one to make music, to be part of an atmosphere full of potential. And always present behind the counter to serve coffee, pastries and sandwiches is Winston Ho-Sang, the owner of this little refuge, with a boyish grin and laid-back attitude that make you feel at home. Winston could have continued the star-bound journey of being a reggae celebrity after he won the Ontario Star Search in 1985, performed at the Bamboo, Lee’s palace, El Mocambo, The Copa, toured the U.S., had two Juno-nominated albums and the Canadian Reggae Music Awards under his belt. But he chose to open Ellington’s for a more stable life with his family and to give back to the community that offered him opportunities he had never imagined while growing up in Jamaica. He is a musician whose core belief is rooted in family values – his mother providing leadership and inspiration. After her separation from Winston’s father in Jamaica, she left her four children with their grandmother and came to Canada to work – any manual work that would bring money and help her reunite with her children. She worked dayshifts and nightshifts for five years and saved every penny to put a down payment on a house before the children came to join her. When ten-year old Winston arrived in Toronto he was wide-eyed. He missed the lush tropical countryside where his grandmother taught him the fine art of picking coffee beans and roasting them, but at his new school he gravitated towards music and sports, privileges that seemed heaven-sent. His instant infatuation with hockey bridged the cultural gap and soon he shared the thrill of gliding on ice and teaming with other avid players eager to pass the puck to him. His natural bent for music drew him to classical studies from grade seven to university. During his last year at Forest Hill Collegiate, some fellow students asked him to join a reggae band, which they named Fu Jah Tive, Jah meaning rasta god. This is the band he toured with. After they split up, some of the members pursued studies in medicine and law. Winston opened Ellington’s. But he never abandoned his passion for music. Last year he launched his latest CD, My Philosophy, at the Revival Bar where he performed with some members of his old band. They also played at Lee’s Palace and at Nathan Phillips Square during the Irie music festival. On stage, Winston has the charisma of a totally engaged singer and songwriter as he bounces back and forth, pouring his heart out to a rapt audience. When asked about the drastic switch from being in the limelight to a self-effacing café owner, he cracks a cheerful smile as if it is the most natural thing to do. After all, he is still surrounded by music. It is that same easy-going personality that makes him receptive to initiatives from residents in the area. He is the kind of man who moves through situations serenely, riding on the waves of life like a surfer who gauges his customers’ suggestions with composed ease before he jumps in. When Charles Roach, a lawyer and poet, contacted him about poetry readings, Winston offered his café on Sundays. When Ben D’Cunha, a professional vocalist and piano player, approached him about a morning jazz jam, Winston gladly agreed. 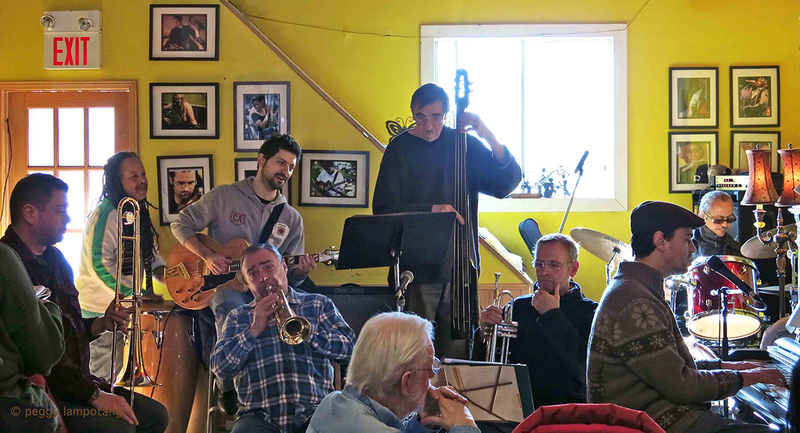 Regular musicians eventually formed the Fair Trade Jazz Ensemble, named after the coffee that Winston roasts himself and that keeps customers coming back to Ellington’s. 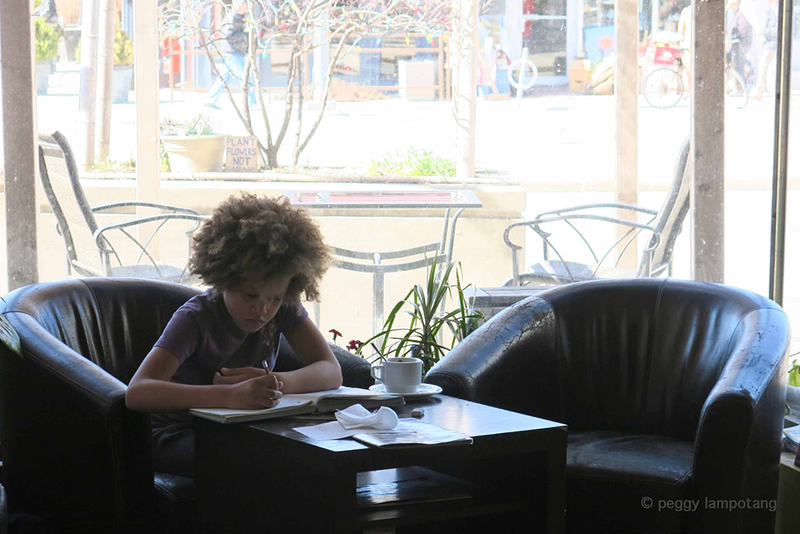 Like the Sunday poetry readings, the jam runs weekdays from 10 a.m. to noon and is now a mainstay of the café. A visitor from New York, excited to sip his coffee while listening to live jazz told Winston that even in the Big Apple he had never encountered such a daily morning treat. It is indeed one of Toronto’s unassuming assets. Winston’s musical fervor does not stop there. He cut his CD in the recording studio he established in the basement of the café. The studio is available for a fee to other musicians. Ellington’s also hosts art exhibitions. It’s open 7 days a week from 9 a.m. to 6 p.m. In the evening, it sometimes holds concerts, events, and private parties. To book, just contact Winston by dropping by Ellington’s. What does Winston like the most about the café? The people, whether they are musicians, artists, writers, students, parents with toddlers, or locals who come just to hang out. But mostly he enjoys his customers’ enthusiasm when he exposes them to different music genres. Personally, I found Ellington’s the haven I needed to finish my novel. I could write there for hours without interruption. An almost sacred respect for music seems to permeate the place. People don’t talk loudly on their cells and there is none of the constant buzz that is common in many cafés – just a soothing ambiance that leaves the imagination free to roam. And where else could the rhythm of live jazz lift your spirit every morning? 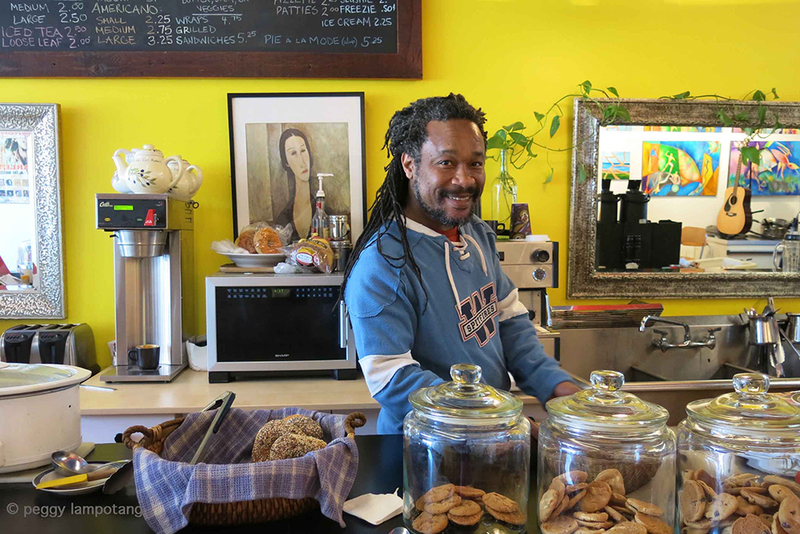 If you haven’t been to Ellington’s, check out this well-kept secret in the St. Clair West neighbourhood and meet Winston, the reggae star who’s proud to serve you his freshly roasted coffee. Peggy Lampotang’s recently published novel is The Coral Heart.